Turn your regular exercise routine on its head with gravity boots! Also called inversion boots, this specialty footwear allows you to safely hang upside-down from a pull-up or inversion bar in order to perform a variety of unique exercises. Regular use helps reduce back pain, improve posture, increase core strength and more. You can even appear taller! Our inversion boot reviews detail the pros and cons of some of the most popular boots on the market today. No matter what your specific needs are, we’ll help you find a boot that fits. Want more information about the best gravity boots? We’ve got you covered with an in-depth, comprehensive gravity boots guide. Before diving into our best gravity boots reviews, here’s a quick overview of our favorite pair. The Teeter Hang-Ups Gravity Boots is our top-choice for gravity boots because they’re flexible, durable, safe and constructed with high-quality materials. Double-locks are safe and easy to use. Thick foam padding covers ankles and calves. Ankle hinge can become loose over time. Exact weight limit is unclear. High in-step can be uncomfortable. Tough construction built to last. Secure lock keeps your feet in the boot. Safety latch for emergency release. Product availability can be scarce. Customer support can be hard to reach. Inversion therapy is a form of spinal decompression that involves hanging upside down to “invert” gravity’s pull on you. Inversion therapy removes the gravitational pressure and increases the space between your vertebrae. By inverting, you use gravitational forces to stretch your spinal column. With inversion therapy, you put yourself in “traction.” Traction is the application of a sustained pull on a limb or muscle. In this case, traction is created by gravity rather than by active pulling or tugging on your spine. Inversion therapy benefits those suffering from back pain, neck pain, and pinched nerves. If you have sciatica, scoliosis, or a herniated disc, reversing the pull of gravity on your spine may temporarily relieve complications associated with compression. A regular regiment of inversion therapy can relieve symptoms of chronic pain and supplement your exercise routines. If you’re interested in inversion therapy, it’s important to consult with your physician. As helpful as inversion can be for some, it can cause serious problems for patients with particular health conditions. Do your research, but most importantly, talk to your doctor. Gravity boots are a unique type of shoe which allows you safely hang upside-down from a pull-up bar, inversion bar or similar support. They’re designed to securely support your ankles and calves. The back of the boot has a sturdy hook designed to keep you hanging in the air. Once upside-down, your spine is able to stretch. The spaces between vertebrae expand naturally. If your vertebrae spend too much time compressed, you’ll often experience back and neck pain. Inversion not only helps reduce back pain in the moment but can reduce chronic pain, too. Aside from standard pull-ups bars, many gravity boots brands have custom bars designed specifically for use with their products. Some boots include a custom bar while other bars are sold separately. Of course, you don’t have to simply “hang out.” There are a wide variety of exercises available you can perform to strengthen your entire body. Pull-ups, twists and other exercises take on a whole new level of effectiveness when performed while inverted. Both gravity boots and inversion tables allow you to safely hang upside-down. People who prefer gravity boots are generally looking for a way to be more active while inverted. Plus, gravity boots take up less space than an inversion table. Hanging upside-down for better health was a huge trend in the 1970s and 80s. The idea was popularized by many action movies where the hero would put on a pair of gravity boots in order to do sit-ups. But, like many fitness fads, inversion training soon fell out of fashion. Recently, inversion training has returned, only this time the benefits are backed by scientific study instead of fictional action heroes. Exercises performed while hanging upside-down can dramatically reduce back pain, neck pain and issues related to sciatica and pinched nerves. Gravity boots and inversion tables are two popular ways to safely invert your body. An inversion table lets you lay down flat and then rotate yourself to an upside-down position. Inversion tables take up a fair amount of space as they need to support your entire body. Plus, a second person is often necessary to rotate the table into the correct position. Gravity boots take a different approach. Many people are initially reluctant to try inversion workouts. If you’ve never hung upside-down for an extended period of time, the process can seem a bit unnatural and even intimidating. Most people are driven to inversion exercise by persistent, chronic back pain. Treating back pain is difficult because there are so many potential causes. The good news is gravity boots can help reduce many different types of back pain. Regular use of inversion therapy helps decompress the spine, which alleviates pain from injuries, poor posture and other causes. On-going back pain often grows worse over time. Without treatment, many people alter their posture in order to feel more comfortable. Unfortunately, slouching and other poor posture ends up making back pain worse over time. Inversion boots help strengthen the spine. When your spine is stronger, your posture will naturally improve. Better posture can lead to a reduction in lower back pain. Back muscles can be difficult to target with exercise. Fortunately, even simply hanging upside down can help strengthen the muscles around your vertebrae. Adding simple exercises allows you to maximize back muscle development quickly and easily. Gravity boot exercises help more than just your back. Inversion exercises are often more effective than their traditional counterparts. Inversion exercises provide greater resistance by making you work against your own body weight. Increased core strength improves the health and flexibility of your entire body. You’ll be able to bend, twist and stretch with greater ease and comfort. Increased flexibility helps makes basically all exercises and activities easier. Now, gravity boots don’t cause you to actually grow. However, years of slouching and poor posture can compress your spine. Gravity boots help you stretch and strengthen your back. As a result, gravity boots can help your body properly support your true height. Some back problems are so severe they require surgery. Unfortunately, surgery is costly, time-consuming and potentially painful. While gravity boots have no guarantee they can prevent surgery, they are an option worth considering. Before you commit to back surgery, you might want to give gravity boot workouts a try. The unique nature of the exercise can provide solutions which other workouts can’t. You might be surprised how quickly you notice a reduction in your back pain, even if you haven’t found success with other methods. Gravity boots are generally pretty safe. But there are some unique risks you should be aware of. Although the risk of falling is rare, it’s still a possibility. Make sure the hooks on the back of the boots are secure. Also, they need to fit the bar snugly. If the hook is too big, you could potentially slide right off when performing a sit up. Most falls aren’t going to be a result of the hook on the boot but will instead be due to a problem with the bar itself. The pull up or inversion bar needs to be properly mounted to a wall or within a doorframe. Check the bar by hanging from your hands in a traditional pull-up position. The bar should support your full body weight without any strain or movement. Once you’re strapped into the boots and hanging upside, you’re in a vulnerable position. In order to get your boots unhooked from the bar, you’ll need the strength to perform a sit-up. Sometimes, people get so wrapped up in their workout they forget to leave a little extra “in the tank” so they can get down from the bar. In order to stay safe, you’ll always want to leave a cord or rope draped over the bar. This lets you pull yourself up even if you’re exhausted. Some gravity boots include a safety cord but sometimes you might need to buy one separately. You don’t have to use anything fancy. Even a belt will probably work. High blood pressure or heart disease. Bone disorders including osteoporosis or a history of injuries. History of eye or ear infections. Your body can take a while to adjust to inversion. Start for small periods of time and slowly work up to longer sessions. While inverted, always use slow, coordinated movements. Avoid jerky, hectic movements as they can result in injury. Absolutely. Gravity boots provide a unique workout. Inversion adds a significant challenge to normally routine exercises. First, gravity boots decompress your spine, which relieves pressure on your vertebrae. Used regularly, gravity boots are often an effective form of physical therapy for back pain. Beyond therapy, gravity boots can take your workout to a whole new level. Inversion forces your body to work against your own mass. For instance, a sit up requires stabilization from your calves, hamstrings and quads. Inversion workouts typically engage a wide range of muscle groups. Gravity boots provide plenty of other exercise benefits, too. For instance, weightlifters use inversion to decompress the spine after a heavy lifting session. Basketball and volleyball players use gravity boots to help their bodies stay as tall as possible. Gravity boots are usually worth the purchase price because they remain useful for a long period of time. Basically, any athlete, of any strength level, can benefit from inversion exercises because always you’re working proportionally against your body weight. Plus, the boots and bar are portable. You usually only need a doorway. Inversion workouts with gravity boots are easy to perform in a hotel room or other travel-related location. Which Gravity Boots Should You Buy? The basics of gravity boots are all the same. They provide safe support to hang upside-down from an appropriate bar. But individual models have a variety of different features which you’ll want to consider. If you already have a pull-up bar installed in your home, you’ll want to make sure the hooks on the boots are a snug fit. If you don’t already have a bar, be sure to check out what options are available for the brand of boot you’re considering. You’ll also want to consider the overall construction of the boot. Is the material flexible enough for a comfortable fit while also remaining durable? Does the boot support the entire foot and calf or just the ankles? Will the size of the boot fit your foot snugly but comfortably? Selecting the right gravity boot often involves balancing the quality of the construction with the price you can afford. Generally, gravity boots cost between about $40 and $75. Higher price boots aren’t necessarily better. You want to pay attention to the actual materials used. Plus, if you need a bar, that might be an additional cost. Things to Look For: What Makes a Good Gravity Boot? A high-quality gravity boot will last for decades. You never want to wonder about the quality of the boot’s construction when you’re hanging upside-down. Most gravity boots are made with a plastic exterior shell insulated with thick foam. Hooks and locks should be made of stainless steel or a similarly strong metal. Pay attention to how the hooks and locks are attached to the boot. High-quality materials become irrelevant if the individual components pull apart when under stress. Go ahead and give the hooks a hard pull to test the attachment strength. Hanging upside-down takes some getting used to, so don’t expect inversion exercises to be super comfortable the first few times you try them. But that doesn’t mean your gravity boots need to hurt your feet. The comfort of a boot is determined by the materials used, the snugness of the fit and the sizing. Materials, such as the outer plastic shell, should be rigid enough to support your ankles but flexible enough to allow for movement when exercising. For additional support, look for removable calf loops. They help reduce pressure on your ankles. Next, you want the boots to fit snugly but not so tight that they press uncomfortably into your feet. Ankle straps should be adjustable by several inches. When trying on boots, wear the same type of socks you plan to use when exercising. Finally, most gravity boots are “one size fits most.” But extra-large options are available. These are a good choice if you’re tall or have large feet, thick ankles or well-developed thighs. A gravity foot should feel as a snug as a ski boot or wrestling shoe. Basically, there should be no “wiggle room.” At the same time, you don’t want the boot to impair circulation or cause any pain. Don’t worry too much if the boots feel a bit complicated to put on at first. Navigating the buckles can take some getting used to. What you really want to focus on is how easy the boots are to take off. After all, you don’t want to struggle with a buckle while hanging upside-down. The safest boots have a double-buckle system. If the primary buckle ever becomes stuck, you can still free yourself by accessing a manual release safety buckle. Practice unfastening the boot when you’re right-side-up and on the ground. Only invert yourself once you feel familiar and comfortable with the design of the boot. As mentioned above, gravity boots average in price between about $40 and $70. As long as the boot is well-constructed from quality materials, you don’t need to spend a ton. Be wary of any gravity boots which costs over $100. At that point you might just be paying for nothing more than a brand name. At the same time, don’t shy away from higher prices if you’re paying for durable materials. A well-made gravity boot can last a long time while a cheaper boot has a greater potential to fall apart. Gravity boots storage usually isn’t much of a problem. Generally, they’re just a bit smaller than ski boots. Most people have no issue simply storing their boots in a hall closet or under the bed. You want boots which are easy to travel with. Most boots can easily fit into a gym locker or duffel bag. When storing boots in a duffel bag, you might want to wrap them in a towel so the hooks and buckles don’t accidentally tear any of your gym clothes. Watch the weight of the boots. Most gravity boots weigh about two pounds. While heavier boots can provide more stability, they’re also less portable. Inversion exercises do require some movement in your feet. You’ll want gravity boots with a slight give. At the same time, the boots still need enough rigidity to support your ankles and calves. Don’t worry too much about the plastic outer shell of the boot, as that’s always designed to provide support. Instead, focus on the inner foam lining. The padding should press up against your entire foot. But you should still be able to comfortably move your ankles and toes. In order to alter the boot’s flexibility, you’ll adjust the fit tighter or looser. Gravity boots are fairly simple and straight-forward, but they do contain a few extras. As we mentioned above, you’ll need a safety strap. This is a cord which you’ll loop over the inversion bar. It’s used to help you pull yourself up to the top of the bar in order to unbuckle the boot even if you’re out of energy. 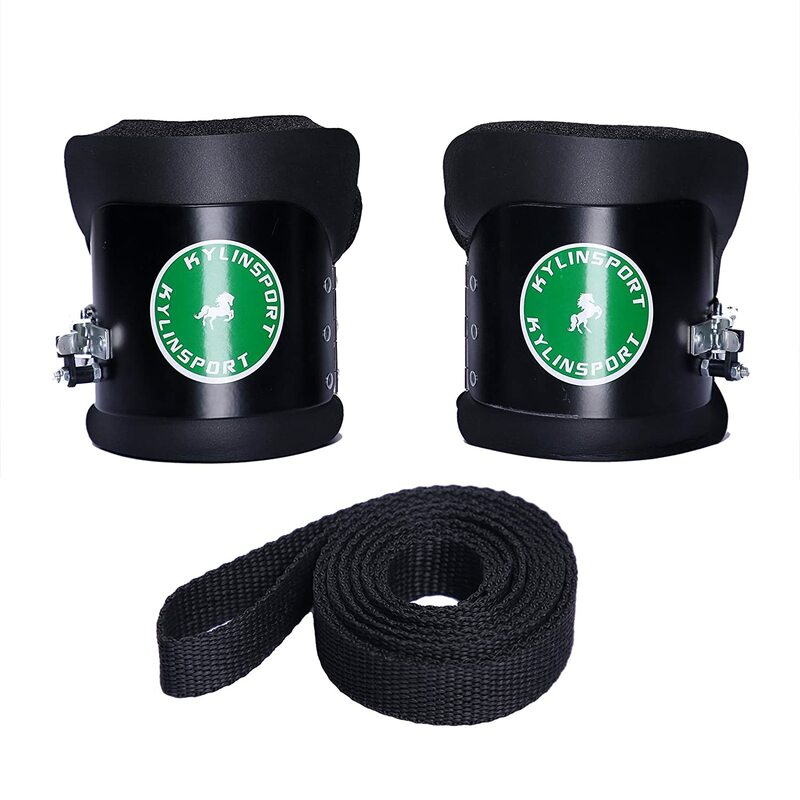 Many gravity boots include a safety strap, but you can also easily use any sturdy rope or cord. Another add-on you want to consider is removable calf supports. These loops wrap behind your knees to help reduce the weight load on your joints and feet. Finally, some boots include an inversion bar. While an included bar is guaranteed to be a good fit for the hook on the boot, it might also be an unnecessary expense. Most traditional pull-up bars will work just fine and are often cheaper. When selecting a gravity boot, you can choose many features based on your personal preferences. Do you want calf support? Do you like the feel of the inner cushion? Do you like the style of the boot? There’s really no objectively correct answer. But the weight limit of the boot isn’t up for debate. You have to select a boot which will support your current weight. Otherwise, you’ll be putting yourself in danger. A gravity boot can look absolutely perfect online but still feel odd or uncomfortable when its actually on your foot. Ideally, you’ll want to try on the pair of boots before you buy them, but that’s not always possible. A rock-solid warranty is the next best option. You want a warranty of at least 30 days. Fortunately, most major gravity boot manufacturer’s offer a warranty of at least a year. This should give you plenty of time to assess the comfort and test the durability of your new boots. Don’t be afraid to be a little rough with your boots. After all, a quality pair should last for many years even with daily use. Before purchasing a pair of gravity boots, make sure you thorough understand any included warranty. Some warranties allow you to return the boots for any reason while others only cover manufacturing defects. Ideally, you want the opportunity to try the boots out for a while with no risk. Most gravity boots don’t have a lot to assemble. They should be basically ready to go right out of the box. Typically, the most assembly required will be any attachable calf support. This is usually just a simple strap you attach to the back of the boot. While not assembly in the traditional sense, you’ll want to note how easy the boot is to adjust. Most gravity boots use micro-buckles to custom fit the exact shape of your foot. A well-made boot should take about 30 seconds to adjust. If the buckles take more than a minute to adjust, the boot is probably needlessly complicated. Most boots will include instructions on how to use all the buckles and other features. While a lack of instructions can be a hassle, it doesn’t need to be a complete deal-breaker. Adjusting a pair of gravity boots is usually pretty intuitive. If you do have a problem with your new pair of boots, can you reach the company easily and quickly? This is an area where the manufacturer can play an important role. While you might save a bit upfront buying boots from a smaller, relatively unknown brand there are benefits to going with a more established company. A larger organization is typically easier to reach. If the company who makes your boots also makes a variety of exercise equipment they’re more likely to have a national customer service phone numbers and email addresses. You want competent customer support reps if you ever have a question about use, returns or anything else. While all gravity boots help stretch and strengthen your spine, we found the Tonyko Inversion Gravity Boots offered the best decompression. With thick, dense NBR foam your legs and ankles will be well-protected and comfortable. Regular use of the boots provides quick recovery from compression fatigue. They’re a good way to heal and recoup after jogging, weight training, bicycling and performing any other exercise which can cause spinal compression. Intense exercise isn’t even necessary to improve your spinal health. Simply hanging in an inverted position for only a few minutes each day will stretch your back, neck and shoulder muscles while also decompressing your spine and discs. If you suffer from back pain due to poor posture, injury or spinal compression, the Tonyko Inversion Gravity Boots are an excellent choice. The ideal user of these boots is looking to alleviate pain and movement issues caused by spinal decompression. If you want pain relief but aren’t particularly interested in working out, these boots are a good option. The unique design combats back pain without requiring exercise. Simply using the boots to hang upside-down provides back benefits. Are you the type who goes all-out every time you exercise? The Kylin Sport Anti-Gravity Inversion Boots can handle rough, heavy use. These Kylin Sport boots have heavy-duty metal hooks, a durable metal band and secure double locks. They can hold up to 150 kg which makes them suitable for people of just about any size. At the same time, these boots are extremely comfortable. They have thick foam padding which protects your ankles without cramping your feet. These boots are built to last. They’re rugged, support a lot of weight and have heavy-duty metal hooks and buckles. There’s no one pair of gravity boots that is absolutely the best choice for every single person. Instead, you should identify your specific needs and choose a pair of boots best suited to meet them. While all of the gravity boots reviewed above have a lot to like, the pair we think has the best benefits for the most people are the Teeter Hang Ups Gravity Boots. Teeter is a trusted name in inversion equipment. Founder Roger Teeter created the company in 1981 in order to treat his own terrible back pain. Over 30 years later, their inversion boots are still considered an innovator in the field of spine strengthening and back pain relief. The Hang Ups Gravity Boots are lightweight but durable. The DuPont Hytrel outer shell provides a rigid stability while reducing pressure on the foot. Inside, the 5/8-inch foam is comfortably snug. Adjustable calf straps provide an extra layer of support during workout sessions. Dual-locking buckles take less than 30 seconds to adjust for a custom fit. At two pounds, these boots are easily portable. Toss them in a gym bag and you can take them just about anywhere. Looking for an effective way to reduce back pain, strengthen your core and decompress your spine? Teeter Hang Ups Gravity Boots turn traditional workouts on their head and provide a wide variety of benefits for your back and body.